After so many Christmas sweets and cookies, I am absolutely craving warm, hearty foods. So, let's start talking about my favorite food group. Bread. For me and Truckin' Man, Bread is it's own food group. Most days we would both pass up a cookie, if we could have some amazing bread. Earlier this year, I started trying some recipes with yeast. I was working on learning how to work with yeast and wanted to master it. I still struggle, but have come so far this year. The bread recipe that is our favorite, comes from Joan over at Chocolate, Chocolate and more... I absolutely love her recipes. She even gave me a virtual "helping hand" while I was learning how to make bread. I will be forever grateful to her! Making this recipe really is as easy as driving to the store, and you don't have to deal with all the crazy holiday shoppers. It even makes 2 loaves ... one his and one hers! I hope you try it and enjoy it as much as we do! Combine yeast and 1/2 cup warm water in mixing bowl, stir until yeast is dissolved. Add sugar, shortening, remaining water and 2 cup of flour. Mix until blended, using paddle attachment on mixer. Add salt and 2 more cups of flour, mix again until combined. 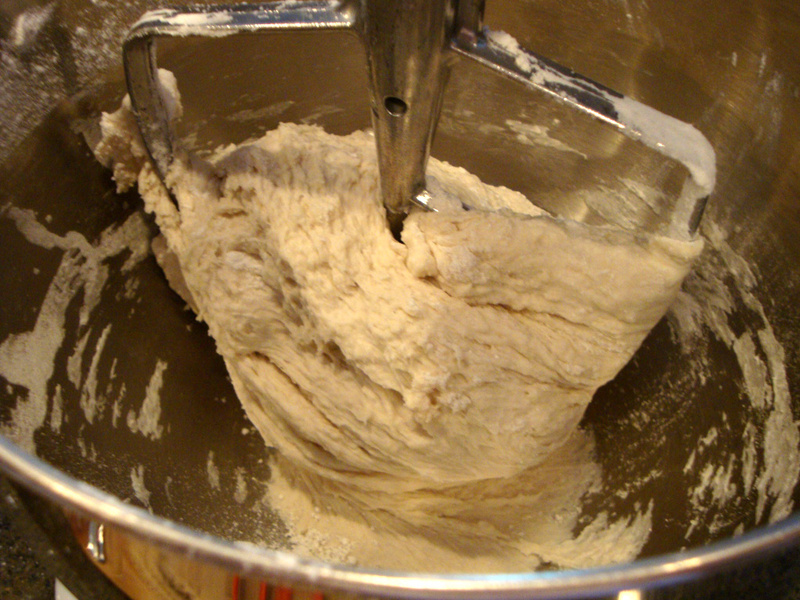 Add remaining flour as needed until a soft dough ball forms. Remove paddle from mixer, and cover bowl to rise for about an hour, until doubled in size. Remove dough from bowl onto floured surface and divide into two equal pieces. Let dough rest for 10 minutes. Roll each piece into a rectangle and roll from long side into a log. Tuck ends under and place seam side down on a greased baking sheet (I use my stoneware pan) dusted with corn meal. Cover loaves with cloth and let rise again, until doubled in size. Preheat oven to 400 degrees. Place 2-3 slits in tops of loaves with a sharp knife. Bake for 20-30 minutes until golden and loaf sounds hollow when thumped. Let rest for 10 minutes and serve warm. I'm with you, bread is a big food group for me! I love it. This recipe sounds delicious too! This loaf is beautiful and the recipe sounds doable for me! Just to let you know that your link to Food on Friday: Berries and Currants was featured in my Need Some Inspiration? Series today. Happy New Year! Kris, I'm so glad you liked the recipe, it's one of our favorites! Just watch out, playing with yeast can become addicting! Happy New Year! This looks lovely! I have been working up to making French bread by using yeast in smaller breads etc... I will try this very soon! Caught you on Thursday's Treasures! I love fresh bread and also french bread. I used to make bread years ago when I lived closer to my family home where there were lots to eat it. Just last even as I was eating some store bought buns I told my husband that I should make a french bread recipe and make buns out it. This just may be a perfect recipe. Thanks for sharing on Foodie Friends Friday and remember to come back and vote on Sunday. It looks fantastic! Thank you for sharing with the Clever Chicks Blog Hop again! what size rectangle should I roll it into? The size varies, but I typically get mine about as long as my baking sheet and just as wide. Approximately 9" x 14"
What a great recipe. Just made this the other day and decided to make it into a loaf. It was delicious and just wanted to thank you for posting this. I really enjoy baking and this recipe is a keeper! 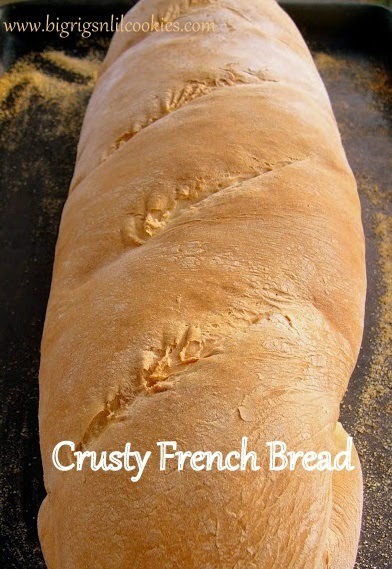 Love this recipe and put it into a loaf pan. The flavor was great. Will definitely be making this on a regular basis. I can't say for sure, as I have not tried that. But, I don't see any reason why it wouldn't work. Please let me know if you try it!